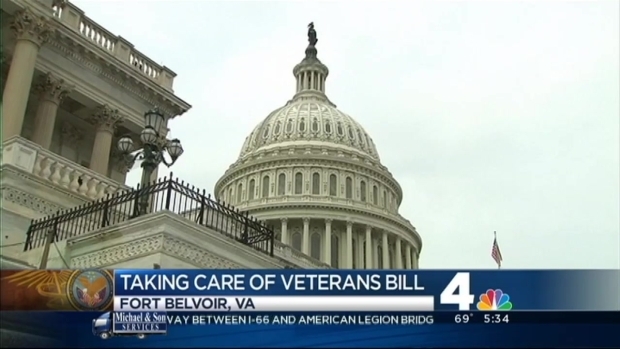 Obama traveled to Fort Belvoir, Virginia, to sign the bill. Veterans may soon have easier access to government-paid health care under a bill President Barack Obama signed into law Thursday, the government's most sweeping response to date to a public uproar over systemwide problems that have rocked the Veterans Affairs Department. With service members, lawmakers and military leaders looking on, Obama put his pen to the bill at Fort Belvoir, an Army base south of Washington, where he held up the legislation as a rare example of Republicans and Democrats working together effectively. Denouncing delays in care for veterans as wrong and outrageous, Obama said the government would keep moving ahead with urgent reforms to ensure veterans have the care they've earned. The $16.3 billion measure allows the Veterans Affairs Department to hire thousands of doctors, nurses and other health professionals at the VA's nearly 1,000 hospitals and outpatient clinics nationwide. 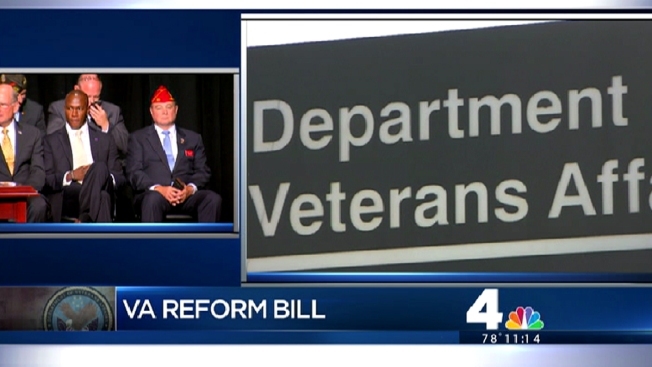 Under the new law, employment rules will be revised to make it easier to fire senior VA executives judged to be negligent or performing poorly. Veterans are expected to have an easier time getting government-paid health care from local doctors under a bill that President Barack Obama is set to sign into law Thursday. Congress approved the measure last week before taking a five-week recess - one of the few significant bills approved this year by both the House and the Senate. The legislation is a response to reports of veterans dying while awaiting appointments to see VA doctors and of a widespread practice of employees covering up months-long wait times for appointments. In some cases, employees received bonuses based on falsified records. The veterans bill, approved with strong bipartisan support, "will put in place reforms and needed additional resources to meet the high standard of service that our veterans have earned,'' said White House spokesman Josh Earnest. The bill devotes $10 billion in emergency spending over three years to pay private doctors and other health professionals to care for qualifying veterans who can't get timely appointments at VA hospitals or clinics or who live more than 40 miles from one of them. It includes $5 billion for hiring more VA doctors, nurses and other medical staff and $1.3 billion to open 27 new VA clinics across the country. The VA has taken aggressive steps in recent months to address systemic problems found in its health care system, Earnest said, adding that reform measures will continue and accelerate under new VA Secretary Robert McDonald. McDonald, a former Procter & Gamble CEO, was sworn in July 30 to lead the sprawling agency, which employs more than 310,000 people and provides health care for nearly 9 million enrolled veterans and disability compensation for nearly 4 million veterans. "This is a labor of love for him, and he has hit the ground running,'' Obama said. The VA announced last week that it planned to fire two supervisors and discipline four other employees in Colorado and Wyoming accused of falsifying health care data. Deputy Veterans Affairs Secretary Sloan Gibson said more VA employees will be disciplined as the agency tries to root out the causes of a scandal that he said has breached the trust between veterans and the agency created to serve them. Gibson, who served as acting secretary for two months after Eric Shinseki resigned as VA secretary, has vowed to protect employees who file whistleblower complaints - a promise McDonald has echoed since taking office. Any intimidation or retaliation against employees who raise concerns will not be tolerated, they said.